Finally, just as my time with the 1050 Adventure draws to an end, I get to the bottom of a disconcerting vibration through the handlebars. It came to prominence after a tyre swap and my initial thought was that the new tyre was out of balance, but a check showed that wasn’t the case. My suspicion fell next on the new tyres, having already checked for play in wheel bearings, warped discs and any slop in the steering head. Swapping the tyres – Avon’s new TrailRiders – for a pair of Bridgestone’s equally new A40s – reduced the effect of the vibration but it was still present and prominent. My rudimentary check for play in the steering head bearings – getting a mate to hoik the front wheel in the air by pivoting the bike on the sidestand while I tried to rock fork legs back and forth – hadn’t revealed that the steering head races were even slightly loose. So the bike was booked in for further investigation with Mark White from my local independent workshop, M&M Motorcycles in Essendine and in the meantime I brought my time with the KTM to a painful end by knackering my knee while riding, of all things, my mountain bike. So it was left to a colleague to ride the 1050 up to Essendine, where Mark got busy with the spanners and tightened up the head races. 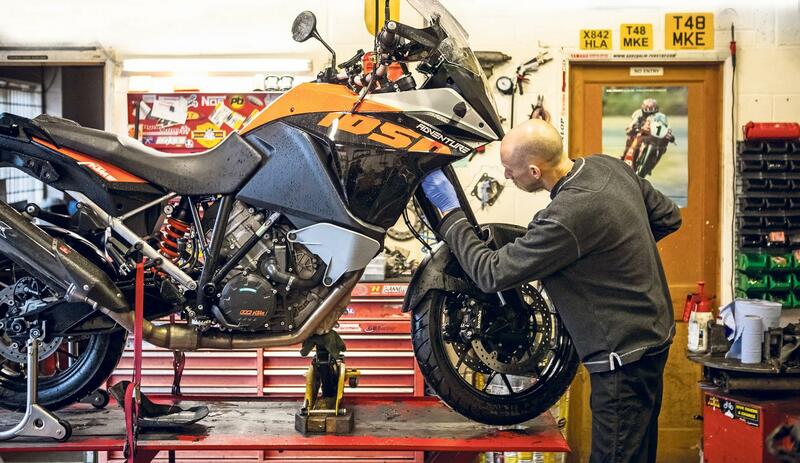 It’s a job that KTM has on the service schedule for the 9500-mile service, but this issue raised its head about 1500 miles before the bike reached that point. KTM say any buyer who experienced this within the first year of ownership could have the races tightened free of charge by a KTM dealer. James Archibald, the colleague who rode the bike to get the work done agreed the vibration was obvious on the journey to M&M, and said it disappeared on the trip back. He then took the 1050 on a 400-mile jaunt to Devon and came back raving about it. That’s the way it’s been all year with the KTM – beneath the niggles lies a very enjoyable and comfortable motorcycle. I’ll miss it.